Obsessive-compulsive disorder (OCD) is an anxiety-related condition that emerges either in prepuberty, which is more common in males, or in late adolescence, which is more common in females, and is distinguished by time-consuming and distressing patterns of repeated persistent thoughts, ideas, impulses, images, and behaviors. The prevalence of OCD in the United States is 2.3% and is slightly lower in pediatric populations (1). It has been estimated that up to 84% of youth diagnosed with OCD have comorbid disorders, such as major depressive disorder, alcohol dependence, and social phobia. Untreated OCD can lead to significant academic, social, and family dysfunction. The current pharmacological treatments for OCD include serotonin reuptake inhibitors and selective serotonin reuptake inhibitors. These drugs can cause unfavorable side effects, including gastrointestinal upset, insomnia, and headaches (2). In addition, these agents can require months to achieve their therapeutic effects, both delaying relief and reducing compliance. As an alternative to monoamine-based therapies, there has been a substantial effort to explore the role of various glutamate signaling pathway modulators as therapeutic targets for psychiatric conditions. Glutamate is the major excitatory neurotransmitter in the central nervous system, and drugs that modulate the glutamate system have emerged as potential treatments with reduced side effects for many neuropsychiatric disorders and as alternatives to dopamine, serotonin, and gamma-aminobutyric acid (GABA)–targeting drugs. With a few notable exceptions (e.g., amantadine, memantine, and ketamine), these drugs have not reached widespread clinical application. However, they may hold significant promise to positively impact and improve patient outcomes if linked to a basic mechanism of abnormal brain physiology underlying abnormal thought processes and behaviors. Building research from clinical and preclinical studies of behavior, physiology, genomics, and epidemiology over the past decade suggest that subsets of glutamate-related substrates may be appropriate targets for brain neurotransmitter and circuit manipulation. As one example of this approach, brain dysplasia in the cortico-striato-thalamic network has been reported in patients with OCD (3). The role of glutamate in the developing brain in general—and specifically in neuronal proliferation, migration, and differentiation—has brought about the hypothesis that abnormal glutamate homeostasis during development may contribute to the manifestation of OCD. Indeed, there have been trials of glutamate-modulating drugs to treat OCD, particularly those targeting the N-methyl-D-aspartate receptor (NMDAR), such as amantadine, ketamine, glycine, d-cycloserine, and others. However, there are substantial risks of excitotoxicity, global over- or underactivation, and severe psychiatric side effects with drugs that directly target NMDARs (4). Therefore, new drugs are now being considered that target the metabotropic glutamate receptor 5 (mGluR5) system, which more subtly modulates glutamate signaling and is hypothesized to be a safer and perhaps more targeted approach to altered glutamate-related brain functions. However, the exact mechanisms of how mGluR5 may be involved in specific psychiatric disorders, including the range of affective and anxiety-related conditions, such as OCD, remains unclear (5). Preclinical animal studies have been advantageous to address this problem and have fostered potential drug targets, particularly for OCD. For example, previous studies suggest that when SAPAP3, a postsynaptic density-associated protein, is knocked-out (KO) in mice, it leads to OCD-like behaviors, including excessive grooming, which was attenuated with fluoxetine treatment (6). These mice also have an overexpression of cell surface mGluR5, suggesting that glutamate hyperactivity may contribute to the phenotype via deficits in synaptic plasticity. Similarly, the marble burying test has been used to model OCD, with inhibition of marble burying used to test potential anxiolytics and antihoarding behaviors. The mGluR5 antagonist 2-methyl-6-(phenylethynyl)pyridine was shown to inhibit these behaviors in models with high ecological validity, further supporting the idea that mGluR5 may be related to this symptom domain (7). However, the mechanism underlying how mGluR5 is involved in this process and if it is able to drive the OCD-related behaviors was not specifically addressed in these previous studies. In this issue of Biological Psychiatry, Ade et al. 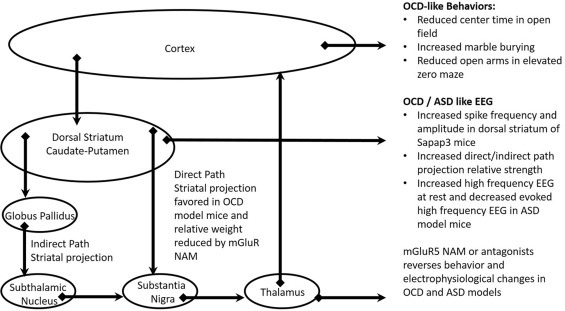 attempt to extend previously demonstrated correlations to provide a causal relationship between mGluR5 signaling and OCD-like behaviors and proposed patterns of striatal activity (8). To approach this goal, they manipulated mGluR5 activity using multiple approaches in Sapap3e., human genes all caps, italic; mouse/rat genes initial cap, italic; proteins are same as gene symbols but all cap regardless of species, and no italic). Thank you! –> KO mice, including pharmacological manipulation using an mGluR5 negative allosteric modulator in vivo to reverse 1) increased grooming and anxiety-like behaviors in open field and elevated zero maze tests and 2) increased striatal neuron activity as assessed by unit recordings. Ade et al. also assessed and pharmacologically modulated striatal projection neurons targeting either the substantia nigra or globus pallidus using in vitro slices using the same mGluR5 negative allosteric modulator in Sapap3 KO mice. The current study replicates previous work by this group and others, further strengthening the confidence that the findings in Sapap3 KO mice and the effects of mGluR5 negative allosteric modulation are reliable and therefore more likely to translate into meaningful outcomes. The primary finding is that acute exposure to mGluR5 inhibition was able to immediately modify circuit and behavioral abnormalities in these mice. This is in contrast to how many (but not all) therapeutic agents work in practice. Specifically, selective serotonin reuptake inhibitors, which are currently the mainstay of treatment for patients with OCD, require weeks to months to achieve their therapeutic effects. Similarly, antipsychotic agents, which are often used as adjunctive therapy in this population, also require months to achieve their therapeutic effects. These long-term interventions likely require substantial remodeling of the cells and circuits involved in abnormal thought content and process, which occurs as the physiological response to increased serotonin and decreased dopamine signaling, respectively. Alternatively, data in the current and previous studies suggest that mGluR5 antagonism may work more like GABA receptor agonists to provide immediate effect. However, it remains possible that like exposure to GABA agonists, there may be long-term effects of mGluR5 agents on remodeling of the brain, and these changes may or may not be beneficial for OCD and other conditions, such as autism, where these agents have been pursued. Therefore, the next logical step will be to examine the effects of repeated and chronic exposure in multiple mouse models, including Sapap3, prenatal valproate, and NMDAR reductions on behavioral, electrophysiological, and anatomical outcomes. In summary, the strength of the current study is based on supporting a causal link for previous observations that mice with disruption of Sapap3 have increased mGluR5 signaling and these OCD-like behaviors and alterations of striatal activity. However, as noted by the authors, there are myriad abnormalities in these mice, likely effecting dozens of cell types, receptor signaling cascades, circuits, and neurotransmitter systems. Of note, previous studies have shown therapeutic potential for mGluR5 antagonists for similar endpoints using genetic, circuit-based, and ecologically validated developmental models in mice (7, 9, 10). Therefore, the current study isolates mGluR5 signaling to test the hypothesis that targeting changes here will constitute a point of convergence that could provide a mechanism-based therapeutic target for multiple etiologies. As such, it forwards the approach that treatments with real-world therapeutic potential will need to address pathophysiological mechanisms that cross multiple etiologies (10). In addition, it will be important to identify biomarkers that predict which subsets of patients share these points of mechanistic convergence (Figure 1) (10). The current study adds one more iterative piece of support for this shift from etiology- to pathophysiology-based interventions. The next steps will be to circle back and determine the best ways to identify the subset of patients who are responsive to mGluR5 therapy. While electroencephalography and imaging may contribute to this effort, the observation in both current and previous work that acute downregulation of mGluR5 signaling had immediate (albeit transient) effects on behavior allows for the possibility that acute symptom relief after exposure may also be a marker of long-term effectiveness. Figure 1 Schematic representation of the relationship among striatal connectivity, mechanistic susceptibility pathways, and metabotropic glutamate receptor 5 (mGluR5) therapy. ASD, autism spectrum disorder; EEG, electroencephalography; NAM, negative allosteric modulator; OCD, obsessive-compulsive disorder. SJS served as a scientific advisor to Astellas and Merck and as a consultant to Zynerba. Dr. Matosin reports no biomedical financial interests or potential conflicts of interest.